To arrive at a Discounted Cash Flow (DCF) valuation, we split our model into a visible forecast period (typically 3 to 5 years) and terminal valueTerminal Value​The terminal value is used in valuing a company. The terminal value exists beyond the forecast period and assumes a going concern for the company. period. Both of these segments of the model require estimating free cash flowFree Cash Flow (FCF) FormulaThe FCF Formula = Cash from Operations - Capital Expenditures. FCF represents the amount of cash flow generated by a business after deducting CapEx in the future. 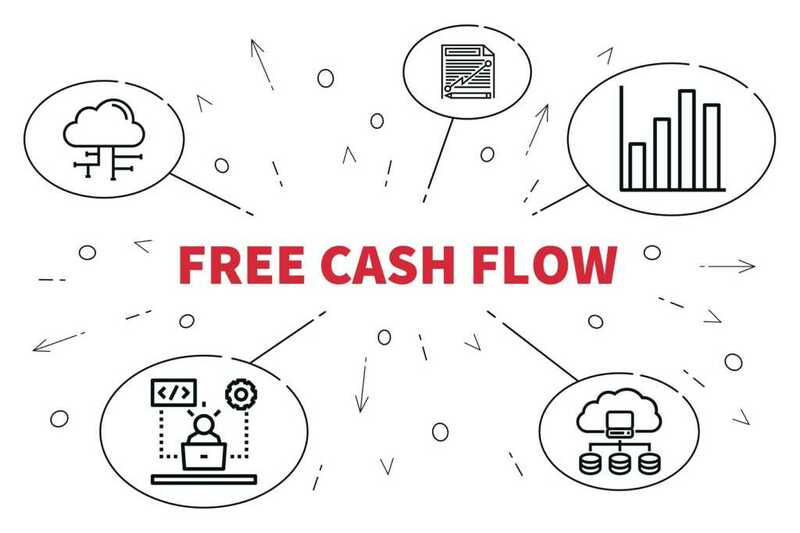 We are interested in estimating free cash flow as the money coming into the firm, available for use, because it is the best measure of a firm’s value. Earnings can be manipulated in terms of revenueSales RevenueSales revenue is the starting point of the income statement. Sales or revenue is the money earned from the company providing its goods or services, income and cost recognition and much of the work of adjustments with comps valuationIB Manual – Adjusting CompsA target or comparable sometimes faces special situations. In such cases, adjustments need to be made to certain metrics and/or the equity or enterprise value. Adjustments to Comps are necessary if there are major inconsistencies, as enumerated below: Currency, Annualization LTM, Pro Forma, acquisitions is spent trying to “clean” the earningsRetained EarningsThe Retained Earnings formula represents all accumulated net income netted by all dividends paid to shareholders. Retained Earnings are part of equity on the balance sheet and represent the portion of the business’s profits that are not distributed as dividends to shareholders but instead are reserved for reinvestment information. In the end, “cash is fact – profit is an opinion” (The Economist, August 2, 1997). 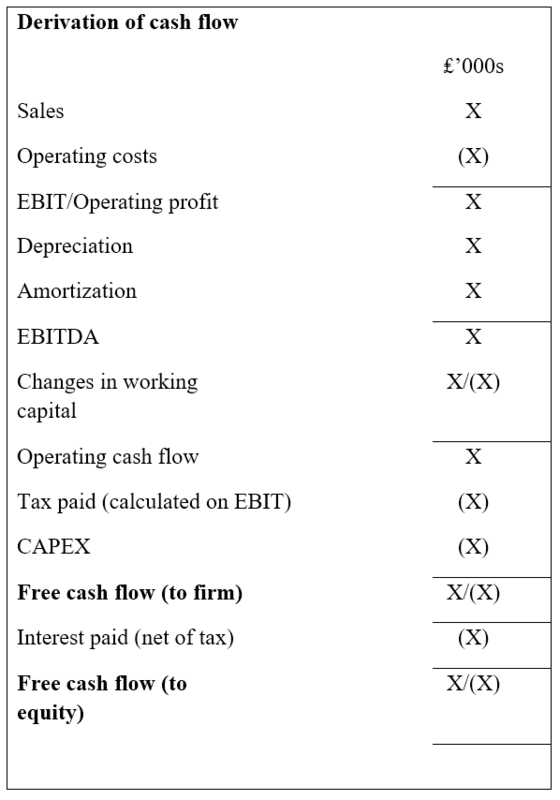 Which cash flows do we use? The derivation above considers the investment required to maintain existing cash flows and support future cash flows. Note that an FCF valuation valuing the whole company (firm value) differs from one that produces an equity valuation. Free cash flow to equity (FCFE) creates an equity valuation and is the cash claim left to equity shareholders after all expenses are paid. In contrast, free cash flow to the firm (FCFF) creates a company valuation and is the potential cash claims left to all providers of finance after all expenses are paid. The main difference between FCFE and FCFF is the interest paid (net of tax) to debt finance providers. FCFF is before interest. To create a forecast cash flow, we need to understand how a business operates. How does a business create value? To properly model, we need to understand what drives cash growth. The analysis examines each of these key drivers. CompetitionCompetitive AdvantageA competitive advantage is an attribute that allows a company to outperform its competitors. Competitive advantages allow a company to achieve (and barriers to entry). 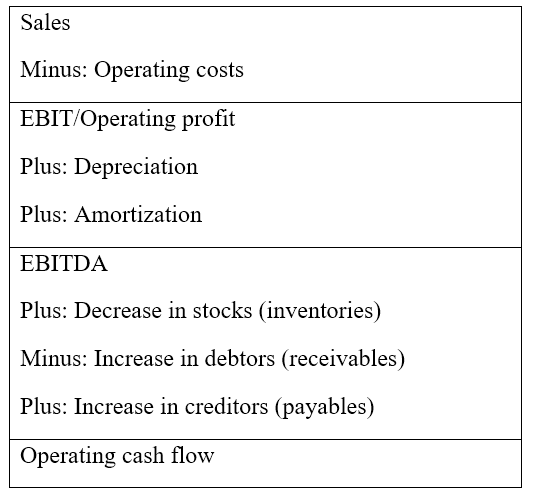 Margins reflect how much a company can retain its earnings while conducting business. Note that margins will depend on industry and the sales it makes. A machinery company with high fixed costs will report different margins and growth rates from a small technology start-up. Margins allow valuation models to go from sales forecasts to profit figures. Cash tax rate is a key driver, as it affects previously incurred tax losses and deferred taxation. In modeling, cash tax rates are driven through EBIT or EBITA (treating the depreciation charge as an approximation to the allowed tax depreciation deduction), with effective cash tax rates adjusting for all other tax adjustments. Maintenance capital expenditure – The replacement of the existing capital base. Investment capital expenditure – The investment in new assets to meet forecast growth projections. The source of long-term growth is an investment in capital expenditureHow to Calculate CapEx - FormulaThis guide shows how to calculate CapEx by deriving the CapEx formula from the income statement and balance sheet for use in financial modeling and analysis. To calculate capital expenditures, use depreciation on the income statement, add current period PP&E and subtract prior period PP&E. Therefore, higher capital expenditure should be reflected in higher sales growth in the short to medium term. As the company expands, working capital requirements should expand in response. With the terminal valueTerminal Value​The terminal value is used in valuing a company. The terminal value exists beyond the forecast period and assumes a going concern for the company., we are estimating the continuing period of our cash flow. The terminal value is used, as to not exaggerate forecasted cash flows because business growth will become constant after a given period. Often the terminal value is used to calculate cash flows that extend beyond 5 to 10 years. Select a terminal value calculation method. Estimate the relevant parameters for the terminal value calculation. Discount the terminal value into present value. The most widely used calculations for terminal value are the DCF method (cash flow perpetuity) and company comparables. 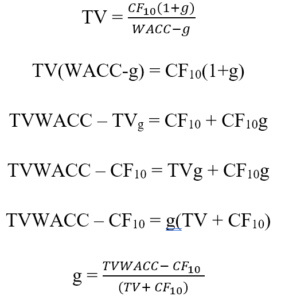 Keep in mind that this formula runs at an assumed constant growth rate. Furthermore, forecasts for growth 5,10, or 20 years into the future are highly prone to error. The reliance on the terminal value calculation as the main contributor to the overall valuation can be managed by extending the forecast period. Growth is easy to exaggerate. Companies will not grow at 8% in perpetuity when GDP growth is 2%. The problem with the above method is that it does not allow growth in capex or changes in working capital. For most valuations with a steady state GDP growth rate, this is not critical, but as higher growth rates are incorporated into the model, the valuation is likely to be exaggerated. We are also able to use profit metrics to forecast terminal value for DCF valuation. In an FCFF DCF valuation, the best multiples to use are Firm Value (FV) multiples, as these multiples will give a firm-wide terminal value. For valuation, the ideal comps to use are the ones for companies with similar business growth and risks. It is believed that the market, on average, prices companies properly. MultiplesTrading MultiplesTrading Multiples are a type of financial metrics used in the valuation of a company. When valuing a company, everyone relies on the most popular method of are often used as a comparison to the terminal value achieved in perpetuity. However, there are disagreements over the validity of comps in valuation. A key issue with comps is that that the implied growth rate is not a transparent element of the terminal value calculation, so it is easy to use an inappropriate multiple that implies excessive growth. Using this methodology, we may determine the implied growth rate based on a multiple.